While everyone would like to live the American Dream of buying and owning a Home it is important to understand all the costs involved in buying and owning a home. Many potential buyers sometimes forget to factor in the down payment, homeowners insurance and the possibility of depreciation, as well as the costs associated with closing the transaction, moving, purchasing major appliances, and home, landscape and pool maintenance, not to mention furnishings and design accessories once you move in. For a general idea of your buying power, multiply your annual gross income by 2½. For example, if you had a household income of $50,000, you might be able to qualify for a $125,000 home. The actual number may be more or less, depending upon your individual situation, debts and credit history. As a general guide your monthly mortgage payment should be less than or equal to a percentage of your income, usually about a quarter of your gross monthly income. The percentage can change depending on the type of mortgage you choose. However, there are mortgage products available that focus solely on the debt-to-income ratio. 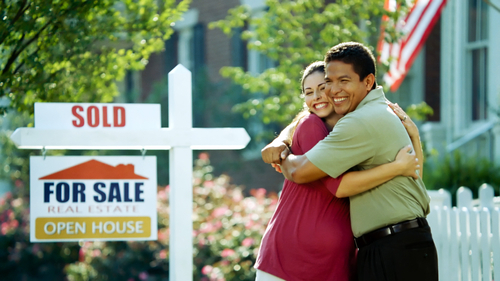 Your lender can provide more information on these types of mortgage products. The down payment is a percentage of the value of the property. What percentage that is will be determined by the type of mortgage you select. Down payments usually range from 3 to 20% of the property value.